Are these guys supposed to be animals (tunicate, tube worms, brittle stars???) or it is just that mermaids grow flowers (tulips, calla lilies, jasmines???) under the sea? I think they are expanding on the corals by adding flower forms. There are a few that are new bigger probable tunicates. They are kind of all over the place though. What's that extinct ammonite doing on the seafloor? On the other hand - that fish on the upper left! When did merfolk get bendy tails? 2019, they are from the new undersea theme. Looks like speedo style bodies with a new mer-tail that has bend at the waist and lower tail. Weird next to the old style ones but more pose-able and therefore better for play for the kids. Lot's of creative color use, and both sexes plus kids. A good theme I think. 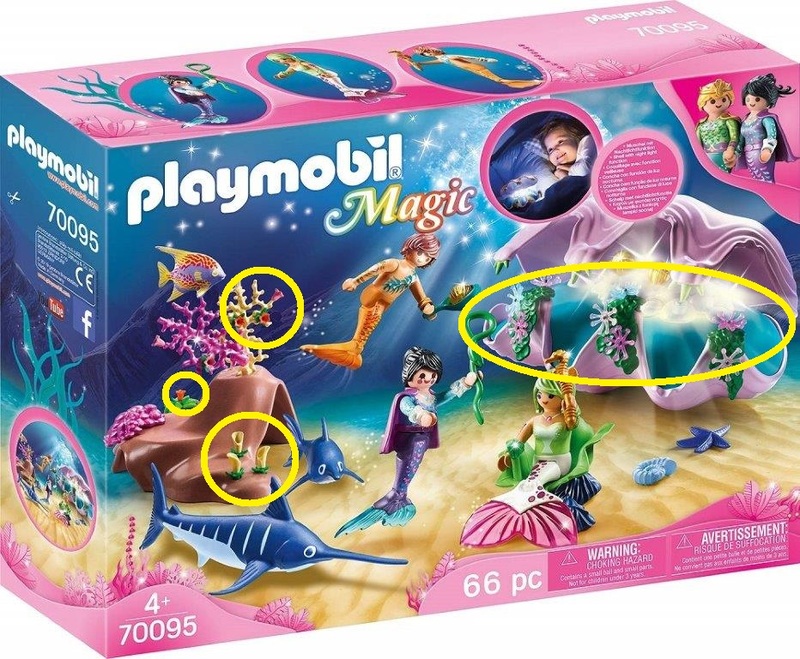 Is it bad that I want the sets for the accessories and not the mermaids themselves? I'd been really hoping the next under the sea theme would have more realistic corals and some more unique fish species. Guess that's not happening for a while!